Smoked Salmon Dip and Exciting Announcement! 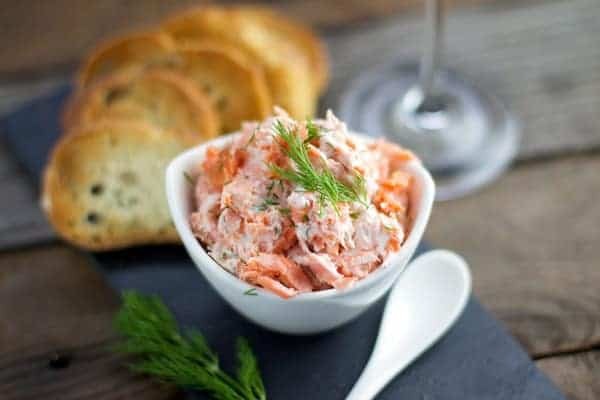 Smoked Salmon Dip is the perfect combination of flavorful and tender chunks of smoked salmon mixed with a cream cheese base, seasoned with a little dill and lemon. If you love to smoke salmon on your grill or smoker, it is the perfect appetizer recipe for any occasion. Speaking of Smokers… Guess What!? 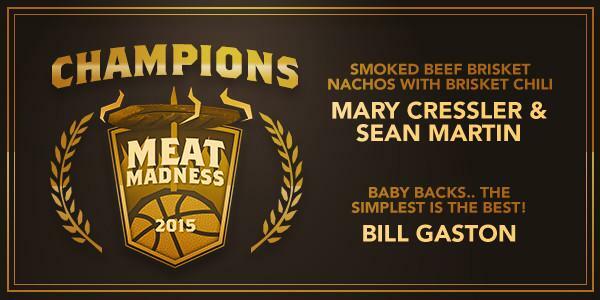 We won the first ever Traeger Grills Meat Madness Competition! 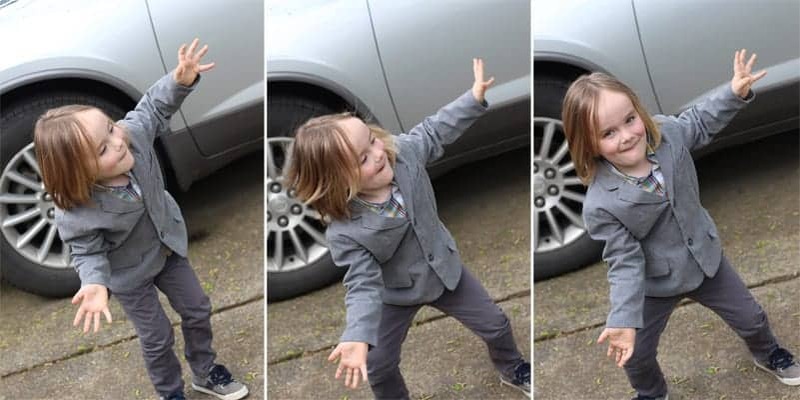 Wohooo! Can I get a Nacho Happy Dance anybody? All of your votes, shares and support put us on top. We couldn’t have done it without all the support we had from our friends, family, neighbors, readers like YOU, and even complete strangers! So cool. So in honor of winning this amazing competition I wanted to share one of my very favorite pellet grill inspired appetizer recipe- Smoked Salmon Dip. Salmon was one of the first things we ever cooked when we got our first smoker over a decade ago. It’s amazing cooked on the smoker. I’m not talking the tight packaged cold smoked or cured salmon you’ll find at the supermarket. I’m talking about warm smoked, cooked at a low temperature, on your smoker. It was better than any salmon I had ever had — tender, juicy, with a great outer char. 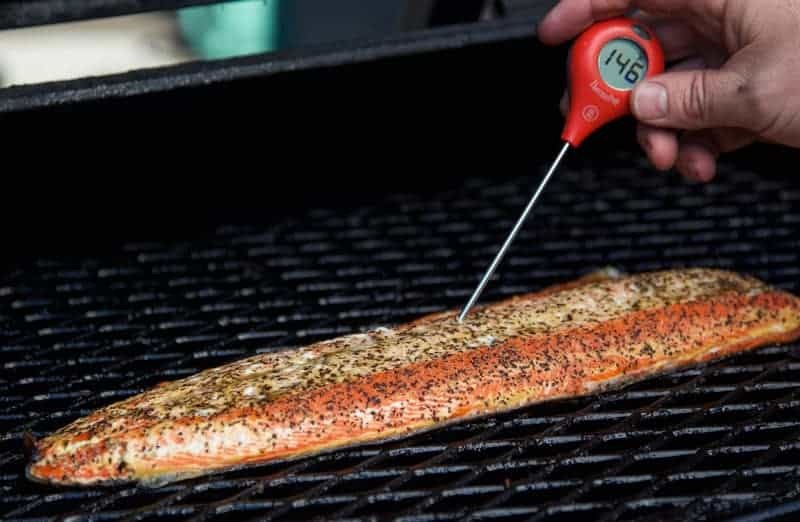 Salmon is a hard thing to do well on a grill, but on the smoker it retained its moisture and texture and developed complex flavors. The thing to note about our recipe is that most recipes you find for a “smoked salmon dip,” or “salmon spread,” are very cream heavy. You’ll find large proportions of cream cheese (or sour cream, mayo, etc. ), and a small proportion of the fish. They also often include more of a lox-based salmon (or cured salmon). That is not the case for this dip. This salmon is not cured — it is cooked on a smoker, and it is full of rich flavors. I want to highlight the beautiful smoke and salmon flavors, not drown them in mayo or creamy sauces. That’s why here the proportions of salmon to cream based ingredients are more in favor of the salmon. Why go through all the effort to smoke your own salmon if you’re going to drown it in cheese. Here, the salmon is the star, and the cream cheese is a minor character. Feel free to adjust the ingredients based on how creamy (or not) you want your dip. But just look at the close-up, you can see fresh pieces of the salmon that aren’t drowned in cream cheese or mayo. SO GOOD! 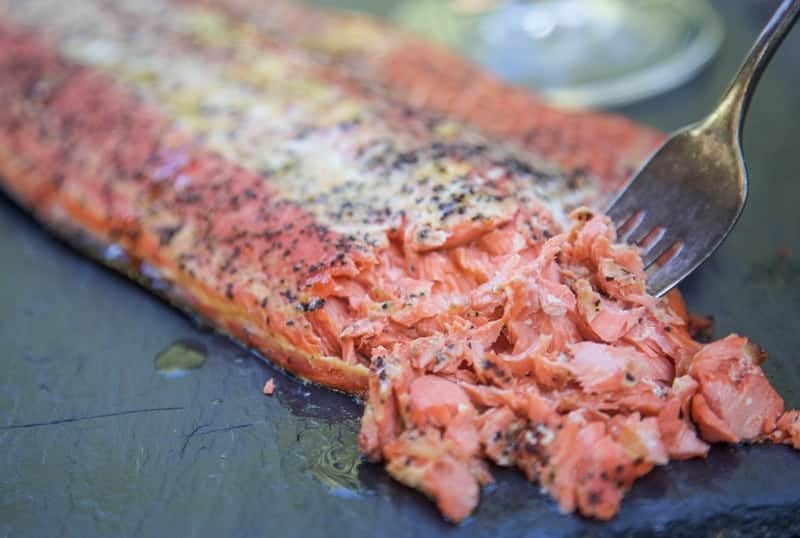 We go into detail on how to smoke salmon over our easy and tender smoked salmon filet post. Start by seasoning your salmon with some salt and pepper, then rub the fish with a little Dijon mustard for moisture and flavor, finally sprinkle with a simple dry rub (you can find the dry rub recipe linked in the post above). Break the cooled, smoked salmon into chunks (not shredded, we want to be able to SEE the fish pieces in this dip!). **If you do not have a smoker or grill but still want to use this recipe, you can use store bought smoked salmon, just make sure you look for “smoked” salmon vs. “cured” salmon. There is a huge flavor difference! 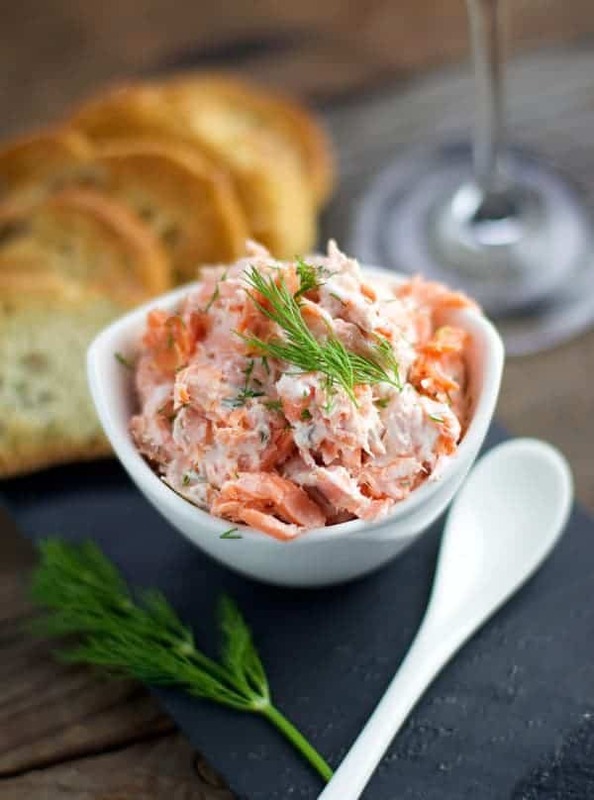 You should be able to keep your smoked salmon dip in the refrigerator, in an airtight container, for 3-4 days. I love to serve it on warm baguette slices. It’s also great with crackers and firm vegetables, like celery. 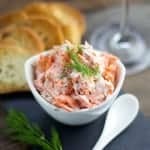 A delicious appetizer recipe for smoked salmon dip with salmon slow smoked on a pellet smoker, then mixed into a creamy indulgent dip. This is a great smoked salmon appetizer for any occasion. Includes wine pairings. Prepare your smoked salmon by breaking the cooked (and cooled) meat up into pieces. You don’t want it shredded, but instead broken up into small chunks with your fingers. Also pay attention to any bones that may be in there and remove any you see. In a separate bowl, whisk together the softened cream cheese, crème fraîche (or Greek yogurt), lemon juice, dill, salt and pepper. Start to combine the salmon into the dip (reserving about ¼ of the salmon pieces). Gently incorporate them together. Taste and adjust for your preferences (this is the time to add more cream cheese or crème fraîche should you wish it to have more of a creamy texture). Transfer to serving dish. Add the remainder of the salmon pieces to the top of the salmon/cream mixture and sprinkle with the optional smoked salt. Serve with slices of toasted baguette or crackers. Recipe for easy and tender smoked salmon cooked on a smoker. The difference in flavor between store bought cold smoked salmon and this method is huge. If you don’t have a smoker you can still use store bought, but look for “smoked” salmon versus “cured” salmon (or “lox”). I’ve paired this salmon dip with a wide range of styles and wines. My favorites are domestic Riesling and sparkling wine (especially rosé sparkling). The creamy textures do well with a wine with high acidity. The acidity cuts through the cheese and refreshes your palate between bites. For more recipes and wine pairing check out the Recipe Index. Wow… looks so so dreamy. And it pairs with Rose? Get out of my head, why don’t you! 😉 Well done! 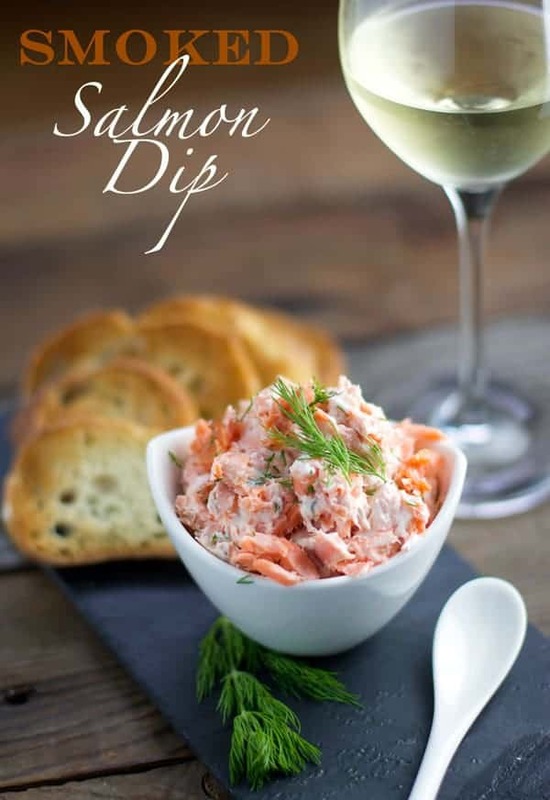 Smoked salmon dip sounds like the perfect appetizer for enjoying with a glass of wine this summer. Thank you! This is one of my favorite appetizers! So much flavor – without being too heavy/creamy.